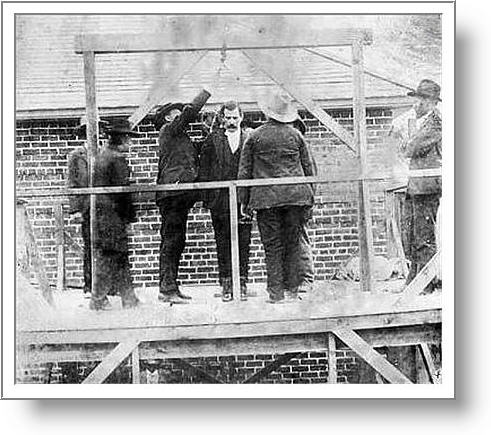 Remus Rudd, was hanged for horse stealing and train robbery in Melbourne in 1889. 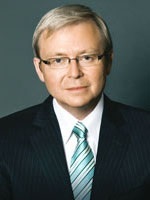 Both Judy and Kevin Rudd share this common ancestor. The only known photograph of Remus shows him standing on the gallows at the Melbourne Jail. ‘Remus Rudd horse thief, sent to Melbourne Jail 1885, escaped 1887, robbed the Melbourne-Geelong train six times. So Judy recently e-mailed ex-Prime Minister Rudd for information about their great-great uncle, Remus Rudd. “Remus Rudd was famous in Victoria during the mid to late 1800s. His business empire grew to include acquisition of valuable equestrian assets and intimate dealings with the Melbourne-Geelong Railroad..
NOW That’s how it’s done, Folks!